This plugin logs hits and visits to your website. You can view the total number of visits and hists, hits per page, referers, user agents and visit durations of the visitors of your web site. Download the plugin from http://get-simple.info/extend/plugin/hitcount/91/ and unzip it to the plugins directory of your GetSimple installation. You can use the functions return_hitcount_hits(return_page_slug()) and return_hitcount_visits() to display hits of the current page and visits on your site. In the GetSimple administration you can analyze the hits and visits on the Support tab - Hits & Visits. There you can also export them as CSV or Excel file. If you create a file /data/other/hitcount_blacklist.txt with IP addresses separated by blanks or newlines, hits from these IP addresses will not be counted. (2.1+) Select Blacklist my browser in the GetSimple administration, Support/Hits & Visits, bottom of page. (2.1+) Now these hits are also logged in the log. You can count file downloads by installing the Download Interceptor plugin and diverting downloads to the interceptor via the .htaccess configuration, e.g. To determine the countries of visitors, go to Support - Hits & Visitors and select Download IP to country database. This will create the files /data/other/ip2country.txt and /data/other/countries.txt. 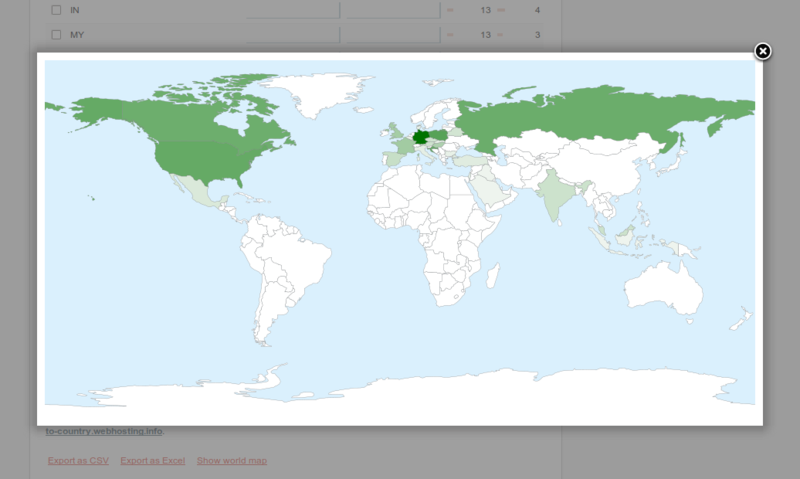 From then on the plugin tries to determine the visitors' countries. You can view the visitors' countries by selecting the Countries tab. You can also view a world map by selecting Show world map at the bottom of the page.